Isolation is set in the time between Scott and Cameron’s movies, when Ellen is missing (we know she’s in one of those sleepy pods). Amanda, who works for the ubiquitous Weyland-Yutani Corporation, is on a quest to find her mother, and when they stumble across the flight recorder for the ill-fated Nostromo (the ship mommy dearest was on), it leads her to the planet Sevastopol. What she finds there…well, from this trailer, I think you know exactly what she finds, and it is none too pleased to be found. As you see, being hunted doesn’t appear to be too much fun (okay, in video game form, it looks like being hunted is a lot of fun). Isolation is all atmosphere and tension and trying not to get eaten or impregnated by a rampaging xenomorph, which is everything you hope for out of a return to the Alien universe. This is one of the rare titles that makes me wish I had any interest whatsoever in playing video games. I don’t, but one of my gamer friends needs to buy this so I can watch them play. And if all of this still isn’t enough to get you to buy Alien: Isolation when it comes out shortly on October 7, you may reconsider when you hear about the DLC missions you can gain access to depending on where you purchase your copy. Certain retailers and outlets will allow you to play as members of the original Nostromo crew, as voiced by the original actors. This includes Weaver’s Ripley, Brett (Harry Dean Stanton), Lambert (Veronica Cartwright), Parker (Yaphet Kotto), and Dallas (Tom Skerrit). That should be an added incentive for a great many people who may have been on the fence. 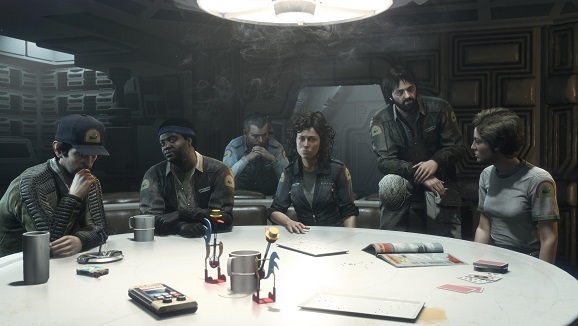 Alien: Isolation will be available on all the usual gaming platforms, like PC, PlayStation 4, Xbox One, and Xbox 360, and hits stores on October 7.